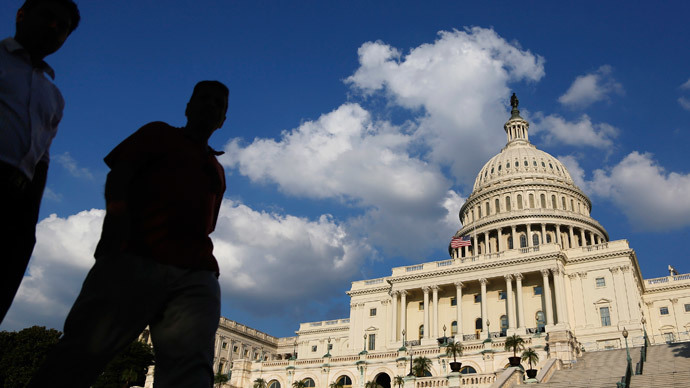 A car owner was arrested in Washington, DC after police discovered a “suspicious” vehicle containing a pressure cooker near the US Capitol building. A bomb squad was called to detonate the object. A US Capitol Police spokeswoman told AP that officers patrolling the area had spotted an unattended vehicle parked on the National Mall west of the Capitol. The officers detected “an odor of gasoline,” which they found suspicious. Even more suspicious were some “items of concern” inside the vehicle – including a pressure cooker. A bomb squad, which was called to the scene, “disrupted” the objects with a controlled detonation. Police then arrested the vehicle’s owner, Israel Shimeles of Alexandria, Virginia, charging him with “operating after revocation.” He was being processed at Capitol Police headquarters, according to AP. It was not immediately clear if Shimeles was responsible for leaving the vehicle near the Capitol, and police have given no further comment on the nature of the charge or details about the objects found. The Sunday bomb scare has apparent connections to the April 2013 Boston Marathon bombings, when two pressure cookers were used by the Tsarnaev brothers in a terror act inspired by Islamist extremism. Three people were killed and as many as 264 were injured in that incident, as metal beads and nails had been added to the cookers to create a shrapnel effect. On May 15, Dzhokhar Tsarnaev was sentenced to death by a Massachusetts jury, while his brother Tamerlan was killed in a violent shootout with police the night after the attack.